So where have I been, anyway? In February, my dog and one of my cats were both diagnosed with cancer within two weeks of one another. Either one alone would have been hard enough, but both of them getting sick at the same time has been pretty hard to deal with. I’ve been spending a lot of time worrying about them. Loco is 14 years old. 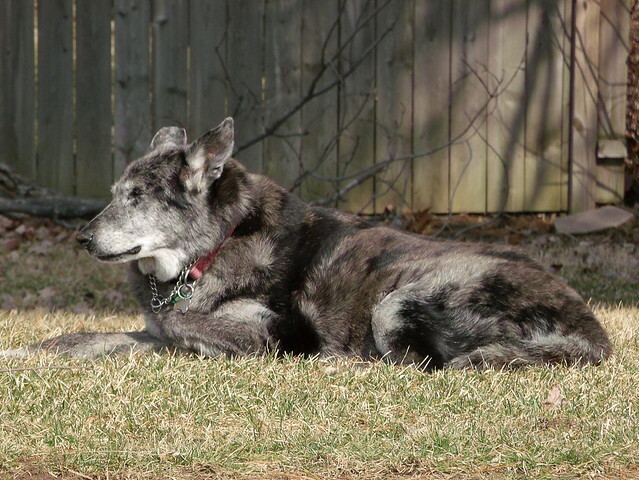 He’d been slowing down some over the course of the winter, and he’s a pretty old guy for a dog his size. I knew this would probably be the year we’d lose him, but I still wasn’t ready, you know? He started getting a little weird about food — only wanted canned food, not kibble, and then he would only eat the canned food if I fed it to him with a fork. Then after this had been going on for some days, he wouldn’t eat breakfast one morning. Took him to the vet, and the news was bad. He has a tumor in his liver, and he almost certainly has one in his nose, too, but we didn’t want to subject him to having that diagnosed (he would have needed to be sedated to get him in the right position for x-rays) because it wouldn’t change anything. At his age, I don’t feel it’d be right to subject him to surgery that wouldn’t necessarily help — and that nasal tumor can only be adequately treated with chemo/radiation. So he’s taking medication to make him more comfortable and help his appetite. The first couple of weeks were scary, with as many bad days as good ones, and there were days when I thought it was pretty close to the end because he was barely eating and getting so thin and frail. But then he started eating a lot more — not as much as he used to, but enough that he’s gaining some weight back, and he’s a lot happier and enjoying his walks and going out for rides in the car. I can’t predict how long it’ll last, but I think we probably have a few more months with him, which I’m so grateful for. Cat getting sick was a huge shock. 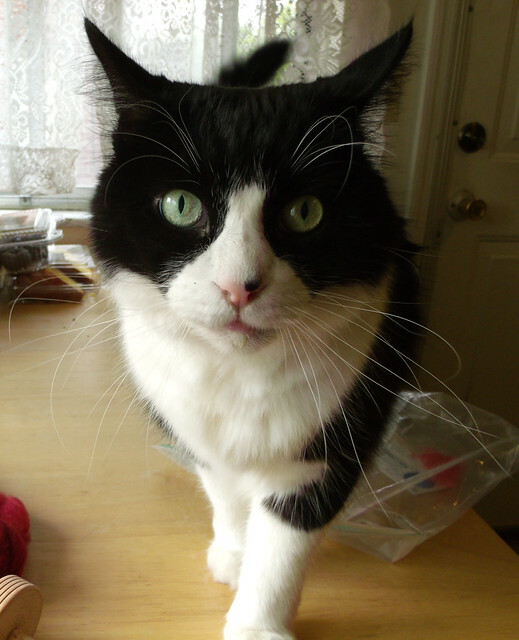 He’s 13, so he’s not a kitten anymore, but… He has a very strong personality, to put it mildly. That photo up there? That’s not him being cranky — he’s that intense all the time. And he sort of feels more like an eternal force. I was completely unprepared for him to get sick. He has a tumor on one of his front legs that seemed to come out of nowhere. One night I found a spot of blood on the couch where he likes to nap during the day and found the lump. At the time it was maybe nickel-sized, raised but not huge or anything, but by the time we got him to the vet the next morning it was was a lot bigger. It’s embedded to deep to be able to just remove the mass, and it’s highly vascularized so it’s very likely it’s spread already. The only option to remove it would be to have his leg amputated — but he’s not young, it’s a front leg, and he’s a very big cat, 17 pounds. It’s not super likely he’d adapt well to having three legs, and it wouldn’t gain him much. Doing surgery without chemo only gains a median 6 months longer life, and that time would be spent healing from a debilitating surgery. I can’t imagine putting him through all that and making what time he has left a total misery for him. The tumor has been getting bigger, but more slowly than at first. It’s starting to bother him a lot, which is incredibly worrisome. He’s still getting around fine, but he’s starting to limp a little — up till just recently it wasn’t affecting him walking or jumping at all and only seemed uncomfortable for him when he was getting settled to lie down. So that was cheery, huh? I also have a bunch of photos of stuff I’ve been making, but I didn’t want to tack them on to the end of this post, so I’ll put those up tomorrow. Meantime I’d better get back to work!